This is one of my favourite simple meals that I love to cook for myself and Becca. It takes about 15 minutes to cook and tastes fantastic. Serves 2. Slice the courgette in half lengthways, and then slice each half finely. Add it to a large frying pan with a little bit of olive oil and a good squeeze of garlic puree. Mix, and fry on a medium heat for a few minutes until soft. Whilst the courgette is softening, remove the fat from your bacon and slice’n’dice into small pieces. Once the courgette is soft add the bacon to the pan. I tend to turn the heat up a bit now to brown the courgette a bit. If you want, you can add even more garlic puree at this point. Don’t forget to give everything a good mix. 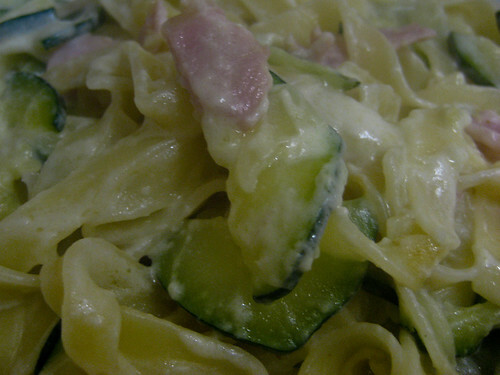 Now that your bacon and courgette is frying, put your tagliatelle into a saucepan and start cooking it. We tend to put four to five balls in. This will be cooked in about 7 minutes. Once the bacon is cooked, it’s time to add your creme fraiche. Just dollop it into the frying pan and mix. It’ll start to turn a creamy yellow colour as it pulls in the lovely juices from your bacon and courgette. Give it a couple of minutes, then drain your tagliatelle and add it too to the frying pan. Mix everything together and serve immediately. Grate some parmesan on top if you’re feeling that way inclined.